New Sony HD Camcorder – PMW500! Come see the ONLY Sony PMW-500 in the country on Wednesday Sept. 15th here in our Learning Lab! This Wednesday September 15th we are excited to showcase (and to experiment with) a newly announced 2/3″ SxS camcorder called the PMW-500 which combines XDCAM Optical Disc performance with solid-state memory workflow. Sony&#39;s new PMW-500 full shoulder camcorder. You could say that it blends many of the best features of the XDCAM HD Professional Disc cameras such as the PDW-700 or PDW-F800 with the SxS solid state recording technology of the XDCAM-EX lineup. This camera was just announced the other day at IBC 2010 and we are happy to have Sony’s Kaori Uno and local DP Doug Jensen with us for a hands-on, practical and informative introduction to the latest in the XDCAM line-up. Please join us at 10:00 am. We look forward to seeing you! Ki Pro Mini supports a streamlined Apple file-based production-to-post workflow, recording native Apple ProRes 422 QuickTime files onto CF cards, which are formatted as HFS+ volumes that are instantly connected to a Mac computer via off-the-shelf CF card readers. “Anywhere a camera can go, Ki Pro Mini can follow,” said AJA President Nick Rashby. “It’s smaller than some battery packs and mounts to virtually everything. We designed Ki Pro Mini for any sized production that needs seamless 10-bit file-based acquisition– it’s about extreme portability and going from lens to post in a flash.” Ki Pro Mini is planned for availability in October and US MSRP is $1995. For a complete set of features and technical specifications, please visit www.aja.com. About AJA Video Systems, Inc. Since 1993, AJA Video has been a leading manufacturer of high-quality and cost-effective digital video interface, conversion and Desktop solutions supporting the professional broadcast and post- production markets. With headquarters in Grass Valley, California, AJA maintains an extensive sales channel of dealers and systems integrators around the world. For further information, please see our website www.aja.com. IBC, Amsterdam, 10th September 2010 – Sony Professional today announced the latest additions to its hugely popular XDCAM HD422 line-up. The new products, which re-emphasise Sony’s continued commitment to the thousands of XDCAM users around the world, include a new XDCAM HD422 memory camcorder – the PMW-500. The PMW-500 combines the exceptional picture quality of the PDW-700 with the operational flexibility of recording onto solid state SxS memory card. The PMW-500 is equipped with three 2/3” Power HAD FX CCD image sensors and can record both 1080 and 720 HD pictures at 50 Mb/s. It is ideal for broadcasters, rental companies and freelancers looking for a versatile memory based camcorder. Major broadcasters, including RTL TVI in Belgium and WDR in Germany are amongst the first to already have placed large orders ahead of product ex-factory. “The PMW-500 represents the next step in the evolution of the XDCAM product range,” said Richard Brooking, of Sony Professional. “Since 2003, XDCAM has become an industry standard with over 150,000 units sold worldwide. Customers have been requesting an XDCAM HD422 memory camcorder for some time to sit alongside the phenomenally popular PDW-700 Professional Disc camcorder. So we are very happy to be launching the PMW-500 at IBC.” The PMW-500 has two slots for recording onto SxS Memory Card*. First introduced to the XDCAM EX range in 2007, SxS memory card provides an extremely high level of reliability and fast access to recorded data, both critical in demanding professional operations. At IBC, Sony is also adding a new higher capacity 64GB (SBS-64G1A) card which can record 2 hours of material at HD422 50Mbps MXF mode, or more than 4 hours of material and has an increased transfer speed of 1.2Gbps (SBS-32G1A & SBS-64G1A). The PMW-500 ex-factory will be within October 2010. “3D has brought a new level of complexity to post-production workflows, and our goal is to help simplify that,” said AJA President Nick Rashby. “The Hi5-3D converter automatically combines SDI input into stereo output and enables video pros to quickly and easily view 3D on a monitor or projector without making major changes to the workflows they already have in place.” Hi5-3D is available In October, and US MSRP is $495. 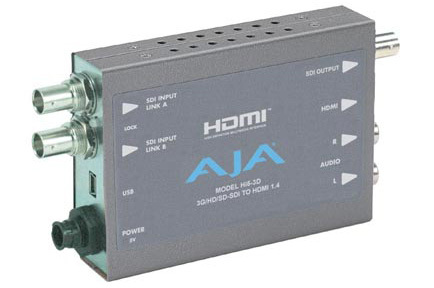 For a complete set of features and technical specifications, please visit www.aja.com.